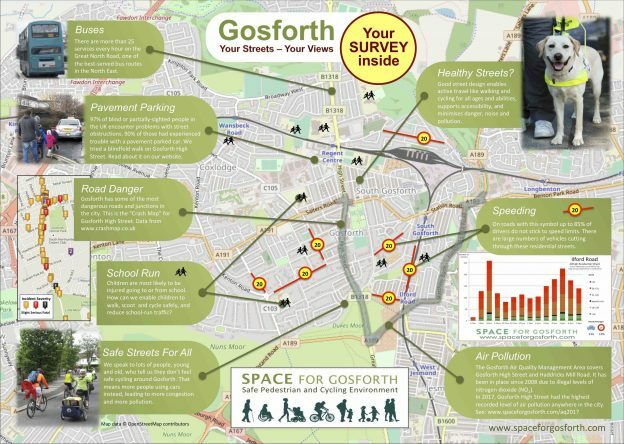 In November 2018, SPACE for Gosforth distributed a leaflet and survey to 14,300 households in the former East and West Gosforth wards and in Parklands ward. This blog sets out some of the main results of the survey covering what you told us about how you travel, your issues and concerns, and how we might go about building a better Gosforth. Thank you to all 704 of you who responded to the survey, and for all the thoughtful and well-considered comments. We have lots of ideas to work through that we hope to come back to in future blogs. Thank you also to the many people who helped prepare the leaflet and survey, proof-read drafts, delivered surveys to buildings the distributor could not access, typed in paper responses and assisted with analysing the results. 1. How do we travel? In the ‘About You’ section we asked how you had travelled in the last month, giving six options. The six options were car, bus, metro, cycle, walking and taxi. If you were to believe some elements of the press then you might think that people are divided into separate groups some of whom drive, some of whom cycle and some of whom walk. In reality the picture is much more mixed and people, for the most part, have a choice for how they travel. In our survey over 90% of people had used three or more different ways to get around in the previous month, and almost 10% had travelled by all six different means suggested. Overall most people walked (93%), took some form of public transport (89%) or used a car (88%). Public transport use was fairly evenly split between bus (69%) and Metro (67%). 40% of people had used a taxi and 40% of people had cycled. Conversely, that means that 7% of people had not walked for a local journey and 12% had not used a car. We can also look at the overlap between different modes of travel as in the Venn diagram for car, cycle and public transport (bus or Metro). The most common combination was car and public transport (46%) followed by all three modes: car, public transport and cycling (33%). Just looking at the overlap between cycling and driving, there is a relatively well-known set of statistics from the National Travel Survey that say 80% of cyclists hold a driving licence and one in five drivers cycle at least once a month. In Gosforth, we found that 93% of people who cycled had also travelled by car and that 42% (just over two in five) people who used a car also cycled – double the national rate. We asked which of eleven common issues are current problems on your street, Gosforth High Street and in Gosforth as a whole (All Gosforth). The answers to these questions don’t tell us, for example, how many potholes there are or how polluted the air is, both of which can be measured objectively. Rather, they show how people feel about these issues and whether they are currently matters of personal concern. The bar chart below shows the top six responses for Gosforth as a whole. We will come back to the High Street and ‘Your Street’ in future blogs. 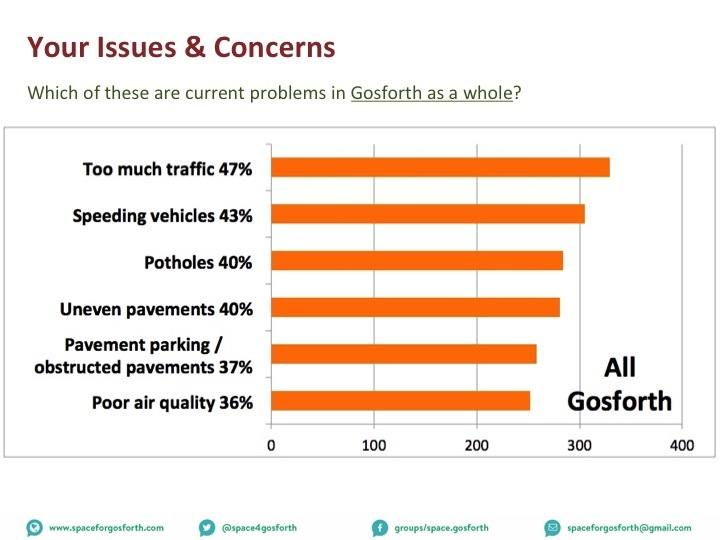 47% of respondents picked ‘Too much traffic’ as a current problem in Gosforth, more than for any other issue. Everyone is affected when there is too much traffic, from delays, from noise, from poor air quality and from an increased risk of collisions and injury. There are various ways in which too much traffic can be discouraged. All rely to some extent on people choosing to walk, cycle or take public transport instead of using a car. 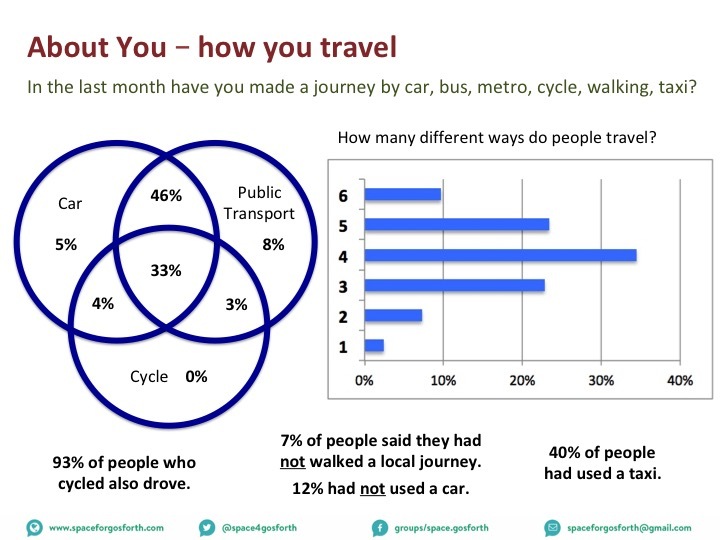 We know from the question about how we travel that the vast majority (94%) of people who drive also cycle and/or use public transport for some journeys already. Speeding, which came second in the survey with 43%, is a criminal offence. It is also the major factor in whether a collision leads to serious injury or death, or to less serious or no injuries. If we want to help people, especially children, stay safe in and around Gosforth, one of the easiest and most important things we can all do is to drive within the speed limits. Whereas traffic volumes and speeding can be affected by how streets are designed, potholes and uneven pavements (both on 40%) are maintenance issues. Potholes and damaged pavements can both be reported to the Council via the Envirocall website. Fifth was pavement parking / obstructed pavements on 37%. As we said in the survey leaflet, a very high proportion of blind or partially-sighted people have encountered problems due to street obstructions including vehicles parked on pavements. The fact that so many people cited this as an issue suggests that the impact of obstructed pavements is being far more widely felt. The sixth most selected issue was poor air quality at 36%. Air quality measurements in Gosforth exceeded legal limits and in 2017 included the highest pollution reading in all of Newcastle upon Tyne. We are expecting an announcement from the Council on their plan to clean up Gosforth’s air in the very near future. The other five issues we asked about, in order, were dangerous driving (33%), cycling on pavements (32%), streets not child-friendly (32%), traffic noise (19%), and lack of dropped kerbs (14%). Just because these issues are of less concern overall does not mean that we should not attempt to do anything about them. Dropped kerbs, for example, will be very important for people using wheelchairs, mobility scooters or push chairs. 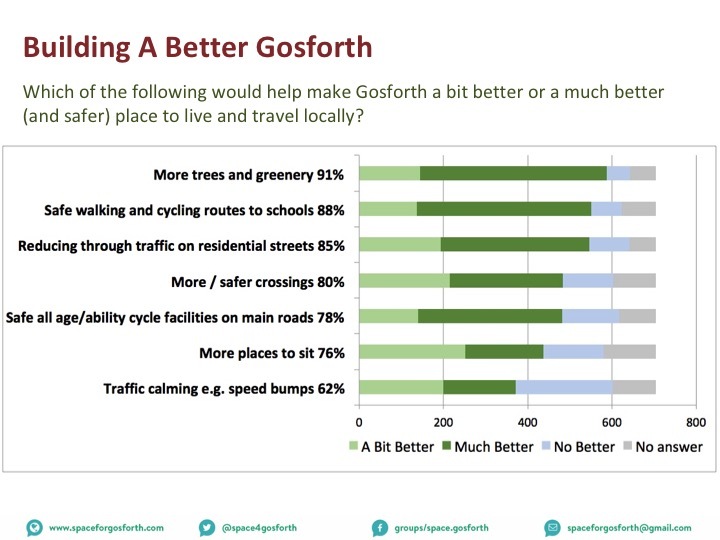 We asked, which of seven potential changes would help make Gosforth a bit better or a much better (and safer) place to live and travel locally? The answers to these questions tell us what residents value and what they want to see in Gosforth. All seven options received majority support. The most popular was more trees and greenery, with 91% of people who answered the question saying it would make Gosforth a bit better or a much better place to live and travel than now. Safe walking and cycling routes to schools, supported by 88% of respondents, was also one of five pledges SPACE for Gosforth asked local Councillors to sign up to at the May 2018 elections. If this helps children and their families walk or cycle to and from school then it will also help to reduce overall traffic levels. At the same time we also asked Councillors to support “Residential streets that are pleasant, safe and attractive places to live and where children can play out”. Reducing through traffic on residential streets, supported by 85%, would make a substantial difference to this. On Gosforth’s main roads, residents also supported more/safer crossings (80%) and safe all age/ability cycle facilities (78%). Least popular of the seven, although still with support of 62%, was traffic calming. SPACE for Gosforth’s objectives include the promotion of healthy, liveable, accessible and safe neighbourhoods. From the answers to this survey we can see there is broad support for these objectives and the changes required to make this happen. If you agree with these objectives you can join SPACE for Gosforth and follow via Facebook and Twitter. Separately, Newcastle City Council is running a consultation until 8 March 2019 to help them “gain a better understanding of the local day to day journeys made by walking and cycling, and how these can be improved in the future.” If you are able to contribute to this you can see and like others’ comments and add your own here. This is in support of the Government’s strategy to increase the number of trips made on foot or by cycle. We are very grateful to the time that everyone put in to provide answers and comments on the survey and we will continue to work through these and publish the results in future blog posts. If you have any specific questions you think might be of interest please let us know via the comments section below. As we said in the survey leaflet, the survey results will also help us identify where there are issues in Gosforth and to come up with specific proposals for addressing those issues. We have already been in touch with a number of local residents’ groups to offer to talk about what the survey results mean for their areas. If you are part of a local group and are interested in this please let us know via spaceforgosforth@gmail.com. In total 14,300 leaflets were distributed and we received 704 responses. The vast majority of those were via the on-line form. Respondents were 51% female, 49% male. The chart below shows the proportion of people who responded by age. 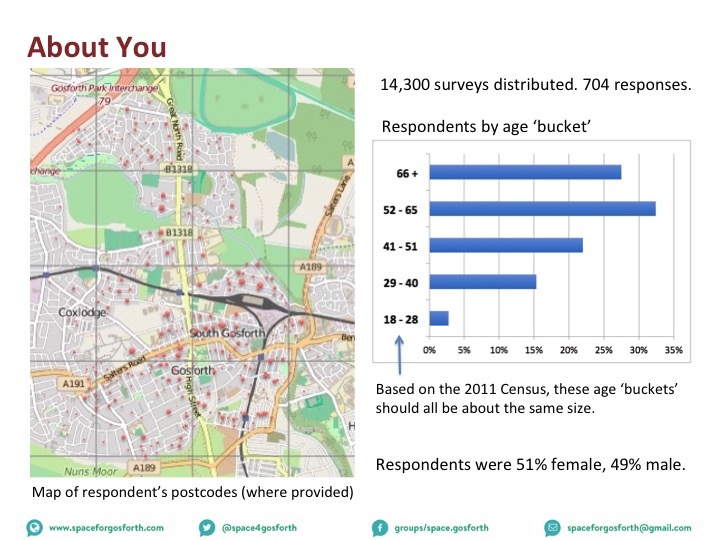 Based on the 2011 Census, these age ‘buckets’ should all be about the same size so it is clear that the views of the over 50s are well represented in this survey, less so the under 40s. There was also a a reasonable spread spread of responses from all parts of Gosforth. In the map above, each dot represents a postcode where one or more people responded. The location for the dots are based on postcode locations rather than individual buildings. If you are interested in similar data, the National Travel Survey and British Social Attitudes Survey ask similar questions nationally. The Council has also published a report on cycling in Newcastle called Bike Life. The National Travel Survey has some interesting results including that approximately 17% of journeys under one mile and 60% of journeys between one and two miles are made by car/van. If this is repeated in Newcastle there are likely to be plenty of current car journeys that could be made by public transport, walking or cycling if those options were made sufficiently attractive. The British Social Attitudes Survey 2017 measures how willing people are to change how they travel. The British Social Attitudes survey also states that 62% agree or strongly agree that “It is too dangerous for me to cycle on the roads”. The Newcastle Bike Life survey also shows strong support across Newcastle. For example, 74% of Newcastle residents support building more protected roadside cycle lanes, even when this could mean less space for other road traffic. This entry was posted in Residents Views on February 6, 2019 by SPACE for Gosforth.